Today we have got a new ubuntu release Ubuntu 6.10 .The common name given to this release from the time of its early development was "Edgy Eft". First thing i would suggest is backup all your important data and start upgrade process and you can use any one of the method to udgrade to ubuntu edgy eft. After installing these packes you should see the following screen and here you need to click on restart and it will reboot your machine to take your new ubuntu 6.10 installation to effect all changes. Edit your /etc/apt/sources.list as root. Change every occurrence of dapper to edgy. Use any prefered editor. If you have a CD-ROM line in your file, then remove it. Now you need to Reboot your machine to take your new ubuntu 6.10 installation to effect all changes. Yes, duh. It’s a standard apt-get update, apt-get dist-upgrade with a new sources.list. I might upgrade when it feels convenient; nevertheless there is no hurry, Dapper is a fine release and works well. Maybe for edgy+1 if I feel like it, or edgy for the new year, but I see no need to do anything precipitate at this point. after upgrading will all my settings especially compiz/xgl work? Yep, the only problem is that this blow out your grub menu.lst so next time you reboot it’s ubuntu and nothing else. I downloaded the 6.10 iso file and burnt it on CD. 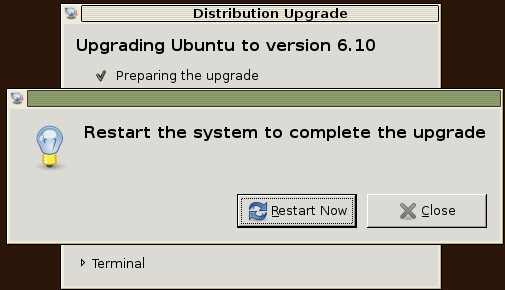 How do I upgrade my Ubuntu from the CD ? Unrecognized option -c when I try using the gksu update-manager -c option. What the hell. I even run update-manager and I still get no option to upgrade. Did I somehow get the retarded version of Ubuntu? My distro now is broken and without faith of seeing my data again…. why i didn’t make backup?!?!?!?! now im downloading the cd to see if im able to upgrade from the cd…. has someone, had success updating from cd??? I’m somewhat of a Ubuntu newbie (recent switch from FC5). Followed the apt-get instructions (copy and paste). Some didn’t produce results I could understand, but most did. Found I had a couple of broken packages which I installed separately using the package manager. After the reboot I lost the xorg stuff. I reinstalled it with apt-get. Things seem to be working. There is one glitch I don’t seem to have fixed. The latest kernel gives a kernel panic. Any solution or should I wait until there is a new kernel and install it in the package manager? Also there seems to be 33 packages held back should I worry about this? I wouldn’t recommend anyone upgrade to edgy. This is most true on AMD64 systems. Stick with Dapper until they have the bugs out of edgy. Edgy’s stability is below WinMe as compared to Dapper which was the best OS ever done. In fact since I have been telling everyone who will listen that Ubuntu is great, this latest version makes me feel totally betrayed. Probably why they named it Edgy. In my opinion I still think Breezy was the best. Quicker install And slightly more stability. I did the upgrade, but now i regret. Where the hell can i get smp enabled? the kernels available for my type of computer is 386, yet with dapper, i had 686 and smp was working fine. so i guess i shall get back to dapper. thanks god ubuntu installs in 30 mins. Do a search in synaptic for linux image and install the 2.6.17-10 generic kernel. Be aware it will update your menu.1st (grub) it supports x86 (686/SMP) and should have went in by default? I had problem upgrading Dapper to Edgy after running Update-manager changing sources.list (naming Edgy instead Dappe) and running Synaptic i had no x ! I have an error installing, after reboot X don’t run so I have upgraded nvidia drivers, now seem to works but grafic interface was better before, some1 have a sceenshot of edgy? I followed Method 2 and have been totally kacked ever since. but haven’t made much progress . . .
anyone who’d like to take a run at this is MORE than welcome . . . I used the update-manager method. It stalled part-way through. I rebooted, and then needed to update a whole load of packages. I was worried it might not boot! Can anyone help, please? I have tried purging openoffice, then reinstalling it, but always get the same problem. 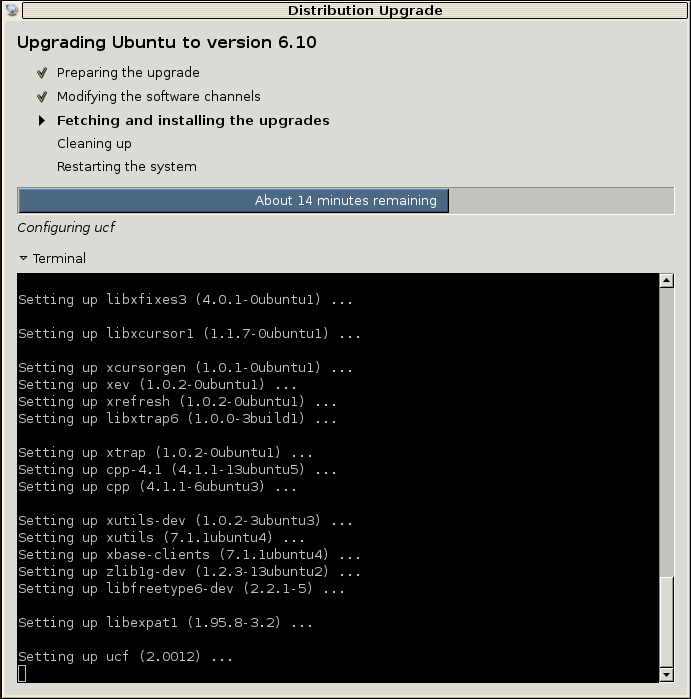 upgraded to ubuntu 6.10 from 6.06 . However, i cannot access the internet. i have a HP Pavilion DV8372 with Intel Pro wireless 3495. It simply does not work. i followed the instructions above, which worked out well but, i can’t access the internet, which is the most important thing to get all the applications working in ubuntu. 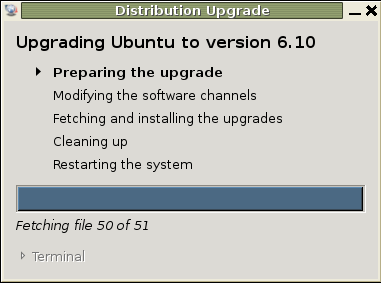 And, i cannot switch back to ubuntu 6.06, i have to instal it all over again. i would like to apologise because the internet is working. i cannot understand why it was not the case before. i have just restarted the computer, clicked on firefox and was able to access google. bizare, i can’t find the network icon on the panel. anyway, thanks a lot for helping me to upgrade from 6.06 to 6.10. I had a big problem upgrading via apt-get. hi guys i have Ubuntu 6.10…..now i m having Ubuntu 6.06 in my system…..i have no internet connection how can i upgrade to Ubuntu 6.10 using te cd…….please anybody help me……………. (1) How to preserve my Windows dual-boot? I couldn’t get method one to work. It would never show the “upgrade” button for the new 6.10 distribution (From 6.06). 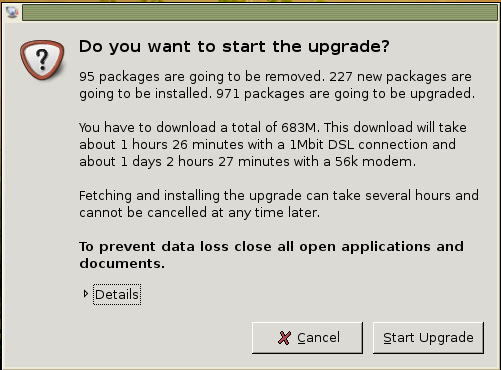 It just kept saying that the system is “up-to-date” even though it was still at 6.06. Method two seems to work and maybe editing the sources.list file is the key. Question. For method 1, how does Ubuntu search for a new distribution? obviously for me it was not searching the correct URL or something. Revelation: Ubuntu still has a long way to go before it can be supported from the GUI for all but just a fey basic things. I could go on about configuring different display resolutions etc (I originally suffered at something like 800×600 even though my hardware supported 1280×1024 untill I found out which file to edit so the GUI would show the higher resolutions in its drop down list). 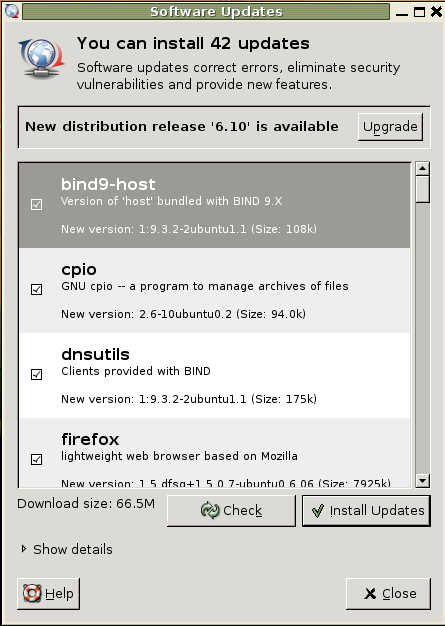 Wish 1): Can Ubuntu cater for upgrade options instead of just first time installations at the Ubuntu downloads home page? 2): Better GUI support for administration functions. 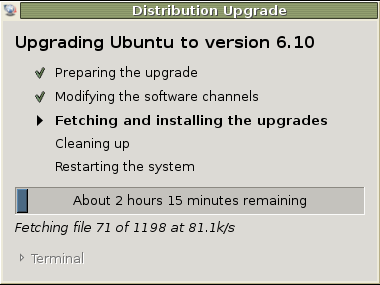 Well, I can only say “thank you” as while following method 1 (which I got from the Ubuntu forums) the upgrade process died (with hindsight, it didn’t but I didn’t know how to continue) 13 minutes from completion. On rebooting the PC I have a little flashing bar, nothing else. Oh dear. I should add I’m very much a Linux newbie. However, I thought, I wonder if I can still get to a terminal vian Ctrl-Alt-F1. Hooray, I could. I logged in and followed the above process with a few changes (from following the ionscreen messages) and the incomplete upgrade was picked up and completed. I then ran the process top to bottom again to make sure nothing had been missed and voila! Edgy installed, kubuntu playing nicely. Ah, to clarify, by “above process” / “the process” I mean method 2. @Sierra: Do you have Kubuntu? If yes, you have to type kdesu instead of gksu. I keep trying to use the first method but I always get this error. I went to my sources and changed them to edgy, but still get the same error. Kinda a linux newbie, so I don’t know exactly what to do. thanks for howto, it works for me. files. I’d like to get rid of the dual-boot, liberating whatsoever is under windows xp, then merging it with /home.